State of Japan, Korea, Singapore and Thailand- Part 1 – We help you think smartly about the crypto and blockchain landscape in Asia 5-10 years out. As you may have read last week, we are rolling out a new post series for our Premium readers. 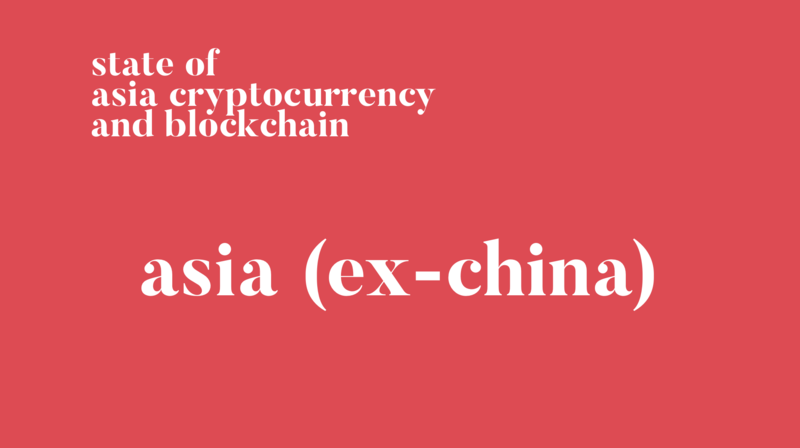 It will feature recurring updates on the state of Asia Cryptocurrency and Blockchain. We have come up with 4 high-level topics, and every week we will be writing about one of these topics, and rotating through them in the following order. Check out our previous piece on China. This week, we will be discussing the latest developments in the rest of the Asia countries- Japan, Korea, Singapore, Thailand and India. Given the length of the post, we are splitting the post into several ones and will keep this post just on Japan. We just also released a A Quick Guide to Asia Market Entry – China, Korea, Japan, Singapore and a spreadsheet detailing the data here. Check it out and let us know if it’s helpful for you. Thank you for reading. GCR recently conducted a podcast with Yusuke Obinata, aka Obi, a developer community organizer in Japan, on the Japanese crypto environment. Check it out here and the podcast transcript here. Here are some main takeaways from the podcast as it is relevant to the update we are providing in this post [lightly edited]. “Even like the regulators are very interested in Blockchain as a new technology; that is new innovative field. They said like when we did the Ethereum meetup with Foundation, Vitalik and then Aya Miyaguchi, the executive director of the Ethereum foundation. They went around to meet some ministers in Japan. So they had a meeting with the Ministry of Foreign Affairs and several other government officials. Why haven’t there been many crypto projects coming out of Japan despite an enthusiastic population and strong interest in blockchain? In the last month, we’ve started to see a growing a stablecoin trend in Japan, and ongoing blockchain banking initiatives appear from Japan’s major entities. We are also seeing a wave of crypto exchanges consolidating in the last quarter, after a series of hacks and regulatory crackdown. Japan’s First Bank of Toyama has entered the fray in launching a state-owned cryptocurrency, due in Oct 2019. Merchants and consumers will have the opportunity to access zero fee remittances and payment options. Additionally, a number of Japanese enterprises and banks are looking to build out financial technology on the blockchain. Japanese multinational IT equipment and services company Fujitsu is building an interbank settlement platform using blockchain technology as part of a joint project with nine domestic bank. MUFG Bank, Japan’s largest bank, is exploring ripple’s technology for new cross-border payment service with Brazil’s Banco Bradesco. Japanese financial giant SBI is also looking to use Ripple extensively with R3, a large blockchain consortium to develop enterprise-grade blockchain networks. Japan’s Shinsei Bank has signed a Memorandum of Understanding with blockchain US-based ConsenSys to widen its exploration of the technology’s applications for finance. Exchanges Coincheck and Zaif were both hacked earlier this year and now they share a similar fate of operating under new acquirers. Coincheck was the Japanese cryptocurrency exchange that suffered a $520 million hack in January. It was since acquired by Monex Group. It has reported increased losses for the third quarter of 2018. Nevertheless, Coincheck has decided to restart by trading a wider range of assets at end of November and plans to reopen New Signups, Deposits and Withdrawals of ‘some’ Cryptocurrencies- BTC, ETC, LTC and BCH. The Zaif exchange made headlines recently following the massive $60 million hack that occured on its platform. It was later bought by a rival named Fisco Cryptocurrency Exchange and has completed its integration. First Bank of Toyama isn’t the first to explore launching a stablecoin. Japan’s largest bank, Mitsubishi UFJ Financial Group is already in the final stages of its own stablecoin experimentation. There is already one store at its headquarters that accepts the MUFG stablecoin as payment. Given that the Japanese Financial Services Agency recently announced that it doesn’t consider stablecoins to be currencies, and that Japan has been one of the earlier adopters of cryptocurrencies, introducing stablecoins into the country is a sound decision to enable more individuals to use and hold digital assets. It is interesting to note that the Japanese conglomerates are very open to partnering with foreign entities. MUFG Bank is Japan’s largest bank. Its parent, MUFG, is headquartered in Tokyo, has over 360 years of history, and is one of the main companies of the Mitsubishi Group. Relatedly, SBI is a large financial conglomerate in Japan and it launched the first bank-owned cryptocurrency exchange in Japan. SBI is also a large Japanese investor and partner of US companies and projects, and last year it led a $107 million funding round for R3CEV, the largest blockchain consortium in the history of the industry that raised hundreds of millions of dollars to develop enterprise-grade blockchain networks. Both aforementioned enterprises are willing to partner with Ripple, which partially speaks to Ripple’s influence and reach in Asia given that we are seeing them getting adopted by numerous large enterprises in Japan, but it also speaks to the type of technology that Japan conglomerates like and their desired use cases for blockchain, that is, private financial blockchains. On the exchange side, we have not seen too much development as the ongoing hacks from the first half of this year and more recently have prevented the FSA from issuing further operating licenses generously. Coinbase has been struggling to acquire a license since beginning of year. Zaif and Coincheck are currently two of the ~14 other exchanges regulated in the country. What we are seeing in the aftermath of the hack is an increasing pace of consolidation in the space. In April,Yahoo! Japan confirmed the acquisition of Bitarg through its wholly owned subsidiary Z Corporation. In September, Huobi acquired a majority stake in Bittrade. Coincheck was acquired by Monex Group and Everybody’s Bitcoin has been acquired by Rakuten. These types of internal improvements and consolidation will likely continue until next year.